$12.50 - FREE Shipping Worldwide! 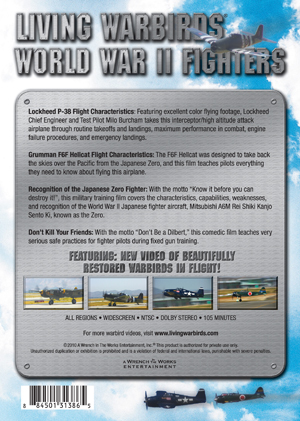 Featuring four original fighter pilot training films from World War II and new video of beautifully restored warbirds in flight! Lockheed P-38 Flight Characteristics Featuring excellent color flying footage, Lockheed Chief Engineer and Test Pilot Milo Burcham takes this interceptor/high altitude attack airplane through routine takeoffs and landings, maximum performance in combat, engine failure procedures, and emergency landings. Grumman F6F Hellcat Flight Characteristics The F6F Hellcat was designed to take back the skies over the Pacific from the Japanese Zero, and this film teaches pilots everything they need to know about flying this aiplane. Recognition of the Japanese Zero Fighter With the motto Know it before you can destroy it! 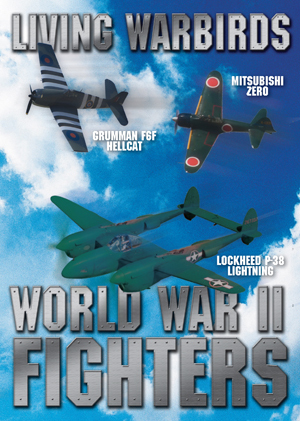 , this military training film covers the characteristics, capabilities, weaknesses, and recognition of the World War II Japanese fighter aircraft, Mitsubishi A6M Rei Shiki Kanjo Sento Ki, known as the Zero. Don t Kill Your Friends With the motto Don t Be a Dilbert, this comedic film teaches very serious safe practices for fighter pilots during fixed gun training. These are the best aircraft DVDs you will ever watch: Aero DVD, Airshow DVD, Planes DVD, Plane DVD, Aircraft DVDs. Other types of DVDs available include: Boeing DVD, Spitfire DVD, Warbirds film, Flight DVD, Fighter DVD, Combat DVD, Airplane DVD, Aircraft DVD, Aviation DVD.